Welcome to our newsletter - catch up on what we've achieved over the past few months thanks to your support, time and donations. See what we're planning next and how you can be involved! 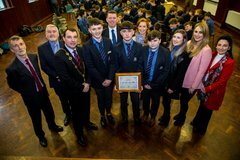 Congratulations to St Munchin's College in Limerick, our first winners of the Solar Schools competition. A fantastic group of students ready to take on the energy transition in their school! More winners will be announced very soon - watch this space! This exciting pilot project targeted a number of areas where community energy cooperatives are already in existence. The aim of the project is to support schools and communities to power themselves with free renewable electricity generated right from their roof. Beat the VAT increase on coffee. Plus a new series of Eco Eye starts tonight. I'm really optimistic we can make a breakthrough this year on climate action (see below for a preview of the possibilities). But first, a quick life hack for coffee drinkers! It hasn't been such a good New Year for those of us who look forward to a take-away coffee at some stage during the day. The VAT increase in Budget 2019 has added 9 to 18 cent to the price of a coffee since January first. Thankfully, there's an easy way to avoid paying the new higher price. Let’s make 2019 the year we choose a safer, healthier future. Poolbeg chimneys. A monument to the sunset industries of the fossil fuel age. Photo by Philip Milne. Politicians and the public are paying attention to climate change like never before. A number of factors coming together gives us the opportunity to make 2019 the year Ireland takes climate action seriously. It's happening. Are you in? Something is happening. And I think I know what it is. The climate movement in Ireland is growing in passion and power. All four of those Bills were initially opposed by Government and the civil service. But people power has tipped the balance towards progress. The way energy is generated, sold and used in Ireland is changing fast. A couple of weeks ago, we asked for your thoughts on buying, investing in and supporting locally owned renewable energy. A million thanks to those of you who took that survey. There is very little Irish research on this topic, so real data from real people is invaluable to us. If you’re interested in the results, you can see them here. Apply now to take part in Mobilize. Resist. Transform. Environmental Issues Course 2018! Are you aware of the existence of envrionmental issues, but unsure how they interconnect? Are you eager to meet like-minded people with whom to delve into these issues and find a point of intervention where you can make a change? Perhaps you have watched a documentary about climate change but don't know where to start in order to make a change, and that can be a lonely, scary place. So maybe you need to feel part of a community to feel supported enough to try to make those changes? If any or all of this sounds like you, then register now to take part in Mobilize.Resist.Transform - a 6 week Autumn evening course run by Friends of the Earth. Last Monday a UN scientific panel published an alarming report on on climate change. The impacts are worse than we thought and to prevent complete climate chaos we essentially have to halve our pollution by 2030 and reduce it to zero by 2050. On Tuesday, the Government introduced Budget 2019, dropping plans for an increase in the carbon tax announced by the Taoiseach, and effectively "giving two fingers to the Paris Agreement" and everyone who is threatened by climate change. It was a staggering failure of political leadership that put us all at risk of devastating climate impacts. We will be posting one article a week in July around ways you can reduce the amount of plastic in your day-to-day life! Let us know how you're getting on on Twitter by using the hashtag #SickOfPlastic. If you are reading this article today and/or taking part in our Plastic Free July challenge, then it’s fair to say that you are already aware of the serious challenges plastic pollution poses to human health and the environment. But do we really understand why its a problem, what exactly makes plastic so harmful and how it is linked to climate change?